The Cottagse are located on a pretty rural lane, backing onto fields and backed by woodland. Opposite is the Gloucestershire Way, a great start for a walking holiday. In addition, there are many beautiful walks that can be taken in the immediate vicinity and at the end of the road is St Anthony's Well, a local beauty spot. You could easily find that you've been staying at the cottagse for several days before you even think about using the car! Come and pay a visit to England's hidden gem! There are no rooms available at The Old Dairy for these dates. Lovely welcome pack, thank you. Cosy cottage. My suggestion to make a more comfortable stay would be to place tv on wall in bedroom, as after lots of walks, a warm bath it’s nice to relax in bed...ps comfy bed too. So many walks in the forest close by as well as lots of dog friendly pubs. The speech house, saracesons head in Symmonds yat east, moody cow are what we would consider to be the most welcoming and good food. We enjoyed a trip to Monmouth too nice shops and friendly people. Our second stay in this lovely , warm and well equipped cottage. We found the Forest of Dean a great place to walk our dog , with plenty of car parks . This is also a great place for mountain biking with lots of well maintained Forest tracks. It was lovely to meet Lorraine and enjoy the cottage which she had thought about and provided "the extras"
We had a good short stay and have nothing but positive comments. Great to find a quality dog friendly cottage, good location for accessing the forest and all it has to offer. Lorraine was so delightful to liaise with. She has a wonderful, professional manner but also comes across in such a warm way too. The homemade scones and little extras for the dog were lovely to walk in to after driving down. The cottage was just perfect for what we needed; a cosy escape for the two of us to enjoy some quality time together. Thank you for that. You definitely need a car to get around! Mitcheldean itself has a couple of shops and takeaways but we found if you drive for just a few minutes there are other villages/towns close by that have more amenities. We had fish and chips from the Mitcheldean chippy which were lovely! Huge portions though s if you don't want any waste get them to share. We also went to the Red Hart Inn with our dog. This is a lovely place for a cosy, pub dinner and they loved having the dog there too. We also wanted to do quite a challenging walk so we parked the car at Monmouth (there are quite a few pay and display car parks) and walked along the Offa's Dyke Path to Redbrook and then back to Monmouth via the Wye Valley Way. It was about a 10 mile walk and after this we wandered around Monmouth. The Boat Inn at Redbrook was a lovely place to stop for a pint! We also went to Simmonds Yat Rock for a gentler walk on the 2nd day. A beautiful place to see with wonderful woodland. It has been lovely to get away from busy life and the Forest of Dean was the perfect place to do that. what a little gem of a place its soo quiet the cottage is spotless and very well equiped , loved the extra touch of the homemade scones jam butter and cream , the dogs loved there treats , had a fab nights sleep was the perfect size for us two humans and our two lab fur babies. Lovely and homely. Everything you could possibly need is provided for. Homemade scones welcoming us was a really lovely treat. They were amazing. Properly has WiFi for those who need to stay connected. We were not bothered either way. We found 2 excellent pubs about 10/15 mins from cottage, “The Red Hart and The Farmers Boy Inn, both dog friendly, excellent food. Old Diary is in an ideal location for great walks in the area. Forest of Dean offers brilliant walks for all ages and fitness. We even saw deer and wild boar. Very clean and comfortable new cottage which had all the amenities needed for a week's stay. Very comfortable - little extras - fruit, flowers, tea, milk etc. all appreciated Plenty of information regarding area - dog friendly pubs and places to go. Maps were useful. Go to Symonds Yat (on a nice day) - spoilt for choice for forest walks - Ross on Wye is a nice town. You must have the wild boar sausages at the red hart. Lovely accommodation, fully enclosed garden a real plus if you have a dog. Nice and quiet as the road is a dead end. Take a look at symonds yat rock, lydney harbour, tintern abbey. Everything about our stay was good. Very pleasantly surprised with how well the cottage was stocked. Basics such as tea, coffee, sweeteners,washing up liquid were there but also found a welcome pack of lovely fruit bowl with nice variety, fruit juice and milk in fridge too ( there was even a dog biscuit, blanket and dog towel left out for our dog). Lovely , thoughtful touch. Would definitely recommend this cottage. This was the most perfect cottage we have ever rented. A list of places to eat is provided, a must is the Bakery which is open Wed to Sun. Your own car is essential. Ideal cottage in ideal setting for a couple with a little dog, impressed that even the dog had a welcome pack as well as the humans. a brilliant easy to use cottage with level parking. We used quite a few pubs for food drinks from the list in the cottage they were all excellent with the exception of the Wye Knot Inn Symonds Yat West, we were suspicious when we were the only people there for Sunday lunch and so it proved as the meal was very underwhelming. Peaceful location with occasional passing traffic. Cottage very comfortable with all amenities. Lovely walks from cottage into woods. Red Hart serves lovely meals and welcomes dogs. Also Weston Cross at Weston under Penyard. Tintern Abbey a must see. Beautiful setting in Wye Valley. We loved this cottage - it was so well done. The owners have really put a lot of time and effort into it - we very much appreciated the little extras - flowers, welcome card, treats for the dogs, fruit, tea etc. Really did make us feel welcome. The cottage is an excellent base for exploring the area. It has a lovely private patio which was enclosed and safely contained our two lively springer spaniels. We loved the sculpture trail which was a 4.5 mile walk - great for the dogs as well! Buy a map though or you might miss some. Dean Heritage Centre was also good for breakfast and the centre itself was fascinating - good place to head to first to give you a flavour of the place - lovely walk round the pond just across the road from it. Lovely cottage, more then enough room for 2. Very quiet location Perfect for us. Dogs welcome in the cottage which is great. In a great area for venturing out. Great walks. Looking forward to returning to explore some more. Well presented and equipped cottage in a pleasant location. I have visited three times a year for at least the last ten years and have always found the facilities of the highest standard. Everything had been provided to make it a very enjoyable stay. There is plenty of information in the cottage about things to see and where to eat out. Great location in terms of proximity to Mitcheldean and the Forest but the photos and description suggested the cottage was isolated on a lane, surrounded by woods, which is not the case. We actually experienced more traffic noise and had closer neighbours than at home. Otherwise a very clean, well appointed holiday home and dog friendly too, which was the reason we chose to visit. Harts Barn Craft Centre just outside Mitcheldean, very welcoming, and reasonably priced goods. Also dog friendly, even in the cafe. The Red Hart, Blaisdon, lovely lunch, also dog friendly. This was a lovely little cottage in an excellent location. It was secluded but close enough to everything we needed. The house was spotless when we arrived and everything inside is of a high quality. We had a great time and would definitely stay again. Symonds Yat is only about 20 minutes from the cottage and has the best views over the Wye Valley. Tintern has lovely walks along the river and a beautiful abbey. We also went to Wales for the day where we visited Raglan Castle (dogs are welcome on leads) and climbed the Sugar Loaf mountain in the Brecon Beacons. We enjoyed a lovely relaxing stay at The Old Dairy. The owner, Lorraine, is delightful and happy to help out with any queries or concerns. The environment is beautiful, with easy access to endless walks, delicious pub food, canoeing and just general relaxing. There is an extensive list of places to go and things to do, located in The Old Dairy, carefully compiled by the owner. It's impossible to be at a loss of ideas! Very comfortable cottage in pleasant rural location with lots to see nearby. Well equipped and with lots of helpful info. Particularly good for dogs. The Wye Valley is beautiful - especially the view from Symonds Yat Rock and the walk up Coppett's Hill from Goodrich. Red Hart at Blaisdon and The Ship at Newnham both very good for meals. 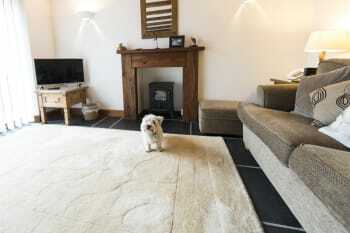 Ideal for dog friendly holiday very comfortable and well appointed. The outside space is okay but not very private or great views. The red hart at Blaisdon is good. There are no good pubs or restaurants within reasonable walking distance from the cottage. Lots of great walks both from the cottage and further afield. Throughly enjoyed our stay with you! Beautiful lodge, was perfect for my boyfriend and I. Surrounded by lovely walks, will most definitely return.